Standardizing your company's document names makes it easy for your agents and admins to comply with your company's document naming conventions. 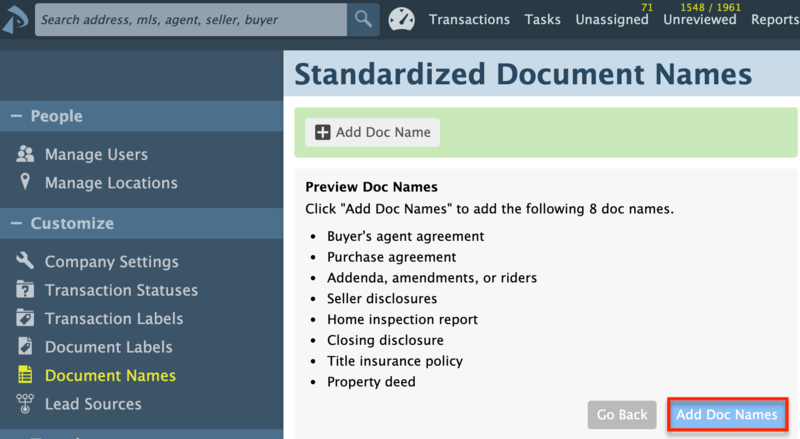 When your users add documents to a transaction, they will be able select a predefined standardized doc name. 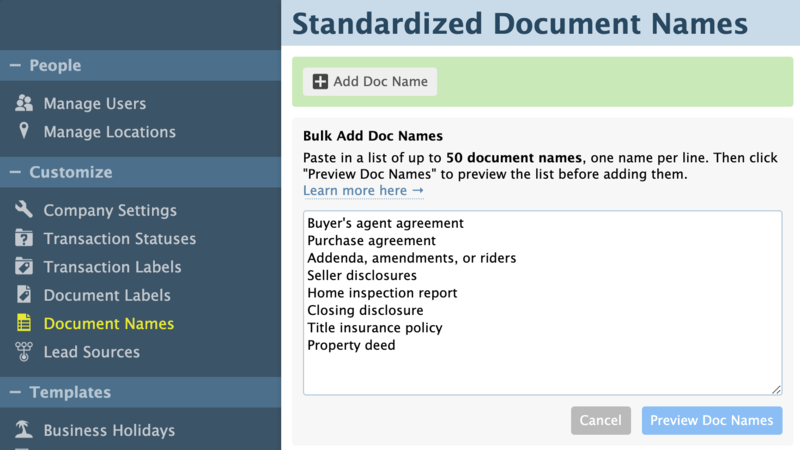 Standardized Document Names make it easy for your agents and admins to comply with your company's document naming conventions. When users add documents to a transaction, they can select a name from this predefined list of standard document names. Setting up Standardized Doc Names is optional. Click [Add Doc Name] to create a new document name. Or, click the gear next to any pre-existing name and then click [Rename] to edit the name. Users will be able to choose from these names when they are uploading or assigning docs to transactions. Standardized document names are not enforced. Users will be able to enter a different name in cases where a standard name is not applicable to a doc. Click [+ Bulk add doc names]. Type or paste in a list of up to 50 document names, one name per line. Click [Preview Doc Names] to preview the list before adding them. Click "Add doc names" to add the document names. Duplicate doc names will automatically be ignored during the bulk add process. Standard Document Names allow you to take advantage of Pipeline's ability to identify the checklist task that corresponds to a document you are working on. In this webinar, we'll go over all the ways Standard Document Names impact how you and your team work and how they can be utilized simply or creatively to save time.